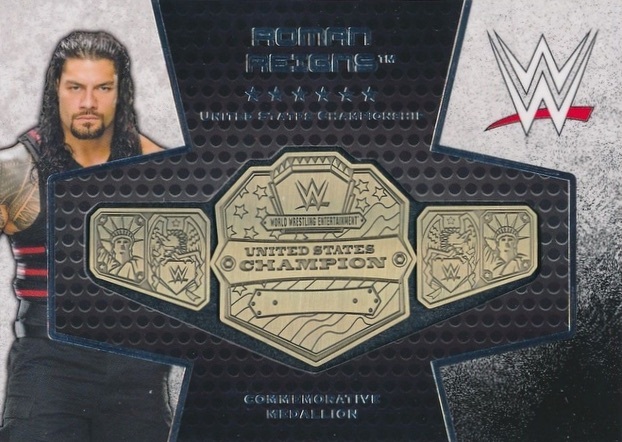 Looking across the wrestling landscape, including Raw and SmackDown Live, 2017 Topps WWE continues the comprehensive cardboard coverage for World Wrestling Entertainment. Each hobby box contains two hits. 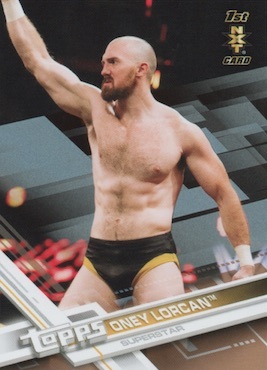 Using the '17 flagship baseball design, the 100-card base set features roster cards for both WWE and NXT subjects, including notations for Rookie Cards and 1st NXT cards. Bronze (1:2 packs), Blue (#/99), Silver (#/25 - Hobby), Gold (#/10) and Red (1/1) editions parallel the base set. The Autographs insert also casts a wide net with a range of subjects, and parallels such as Blue (#/50), Silver (#/25 - Hobby), Gold (#/10) and Red (1/1). Pairing two signers on the same card are the Dual Autograph (#/10) cards. Other hit options in 2017 Topps WWE Wrestling include familiar Kiss Card inserts that come in both base (#/99) and Autograph (#/25) versions, each with their own Gold (#/10) and Red (1/1) parallels. 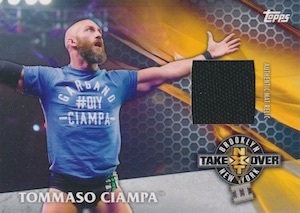 On the memorabilia side, the Mat Relics inserts contain event-used canvas pieces from either SummerSlam 2016 or NXT TakeOver: Brooklyn. 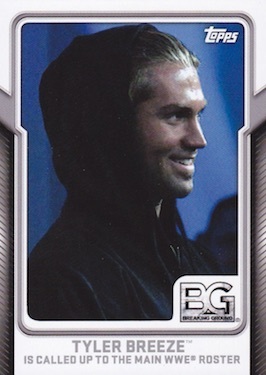 Other choices include the Commemorative Champions cards that honor the eight recent champs. Blue (#/50), Silver (#/25 - Hobby), Gold (#/10) and Red (1/1) parallels apply to all three relics. 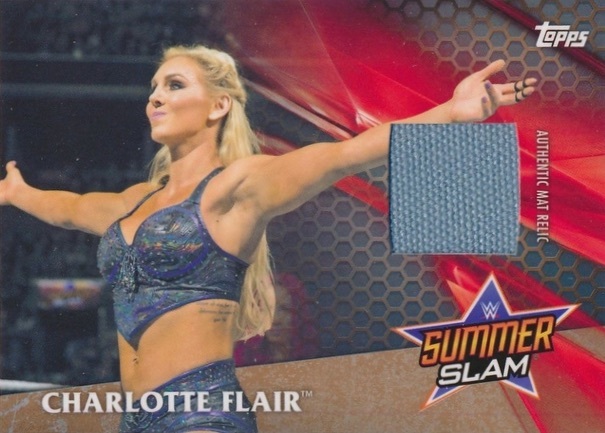 There are also Autographed Mat Relics (#/10) for SummerSlam 2016 and NXT TakeOver: Brooklyn. 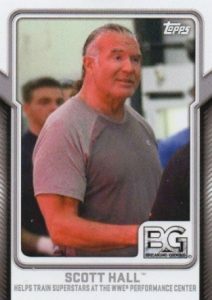 Finally, multiple standard inserts close out 2017 Topps WWE Wrestling. 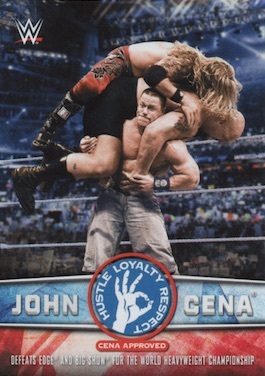 John Cena Tribute Part 2 is the second ten-card set of the 40-card honorary insert spread across the Topps Wrestling lineup. Meanwhile, Total Divas (1:2 packs), Stone Cold Podcast (1:4 packs) and WWE Breaking Ground (1:2 packs) inserts are a trio of behind-the-scenes options. UPDATE (3/21): Topps revealed that 2017 Topps WWE Wrestling is the first of several WWE sets in 2017 to feature Undertaker autographs. Others include Undisputed and Heritage. 2017 TOPPS WWE BIG CASS AUTHENTIC AUTOGRAPH SSP AUTO 99 STILL SEALED! NEW! Base code ends #4658, variations end #4665. 28 cards. Serial numbered #/99. Shop on eBay. 10 cards. Retail exclusive. Shop on eBay. Continuation set of 40 total cards. AUTOGRAPH PARALLEL CARDS: Autograph #/25 or less, Gold Auto #/10, Red Auto 1/1. PARALLEL CARDS: Bronze #/199, Blue #/50, Silver #/25, Gold #/10, Red 1/1. 5 cards. Serial Numbered #/10. Shop on eBay. 25 cards. Serial numbered #/199. Shop on eBay. 16 cards. Serial Numbered #/10. Shop on eBay. 8 cards. 1:4 packs. Shop on eBay. 20 cards. Serial numbered #/299. Shop on eBay. 10 cards. 1:2 packs. Shop on eBay. Good: Strong autograph checklist, at least one autograph per box, base variations add new chase element. Bad: Sticker autographs, not all hits numbered, basic inserts feel like filler. The Bottom Line: Still fundamentally similar to past flagship WWE sets, 2017 stands apart with a stellar autograph checklist and at least one signature per box. This has resulted in increased demand and higher box prices. Continuing the tradition of using the flagship baseball look, I again think the base design works better here. The interlocking frames have a sort of ring-type quality that lets the full-bleed image take focus while still maintaining the wrestling feel. 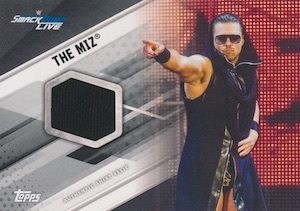 Also, the little things are nice with RC logos and "1st NXT" card designations. I do notice that the older subject images have a haze that can detract from the appeal. Incorporating the variation craze that has already saturated other sports, the extreme rarity and newness for WWE collectors is a solid addition even though could have kept the list to ten names or so for the first go. 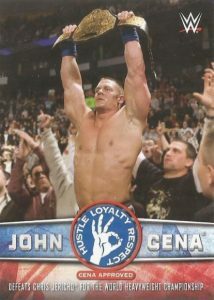 From there, it’s a lot of the same with some tribute sets (Undertaker, Cena and Daniel Bryan) and a multitude of hits. To me the Breaking Ground, Stone Cold Podcast and Total Divas inserts seem like more of a marketing play than a worthwhile addition to the set. Plus, they all have the same design. However, I realize that it could be a nice add-on for collectors who enjoy those programs. On the design side, there is not a whole lot else to mention. I know that manufactured relics are not preferred by many collectors and I generally agree, but I do like the look of the Commemorative Championship Belt Relics. It fits well here compared to medallions in other sports but these are still somewhat disappointing since they count as a box hit. It is also a little bit of a bummer that these still have sticker autographs when other sets, including Road to WrestleMania, are hard-signed. 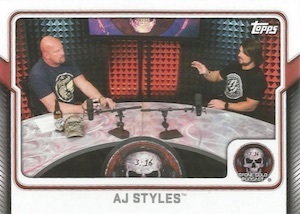 The autograph checklist is where 2017 Topps WWE Wrestling makes its mark. A solid rotation of old and new is built around signed cards from Goldberg and The Undertaker. This is especially notable since neither wrestler has many prior autographs. Only serial numbered autographs helps, as well. For some reason, the base Kiss cards are not numbered. 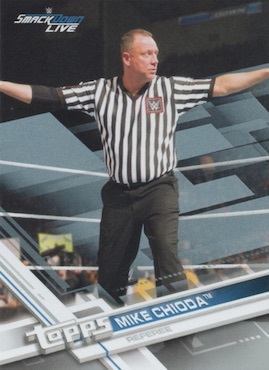 In addition to the WWE programming inserts, there are also new referee cards in the base checklist which does expand the normal coverage a bit. Two main factors help 2017 Topps WWE Wrestling box values. The signer list is the biggest draw since Undertaker alone has been selling for $300+ but the other thing to note is that the box guarantee now specifies one autograph and one other hit. Knowing you are going to get a numbered autograph alleviates a fair amount of the risk of previous releases. It certainly doesn’t guarantee a huge ROI, but at least you know you aren’t getting two relics for around $70-80 per box. Given all the theatrics of wrestling, it can be fun just sifting through the piles of colorful base cards even though the dark backgrounds can bring the mood down. I admit the regular inserts did little for my enjoyment but I did appreciate the overall variety of the base set. It was also nice to pull a fairly huge triple autograph as my signed hit. Looking ahead, as this is the flagship wrestling set, I would like to see an original base design but would settle for on-card autographs. Just what we need.. more fake commemorative hits.. 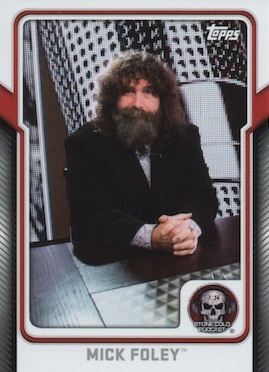 I wish topps would give up their rights to making wwe cards cause they obviously don’t what a hit is.. for this reason aline, that is why this gets a 2 sfar.. I’m just ordering if there will be worn relics or is mat relics are more fake hits all we get? Price going up with the announcement of Undertaker autos. I did hit A Undertaker photo variation. I’m going to confirm The Brian Kendrick as a photo variant.. I opened a blaster and thought I got dupe Kendricks but they had different photos.. anyone know how rare these are? In terms of WWE base products, 2017 is one one of the better products that Topps has released in recent years. – photo variation short print cards, this is always a nice wrinkle for us to chase after. – Manufactured relics. The belt cards are cool but should not be considered a “hit” The only difference between this years products and years past, is that these cards are thinner and the metal in the belts look t be cheaper and duller. Wasted hit. – Kiss cards. we all love kiss cards BUT in this product many are not aligned in the window well and more importantly; not numbered. For all we know they kissed 1000’s (poor girls) of these cards.. Value buster here. If you were lucky to get a preorder in for the product you saved some case. 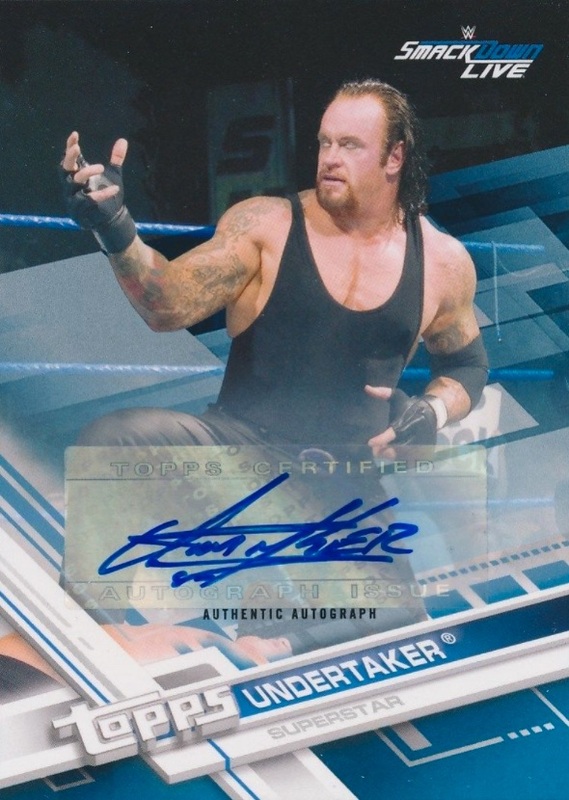 The Undertaker autos have driven the price up on these and I am sure that it will continue to rise. Pulled a Red Parallel Base card in a $1.99 pack. How valuable are these typically as it is numbered 1/1?